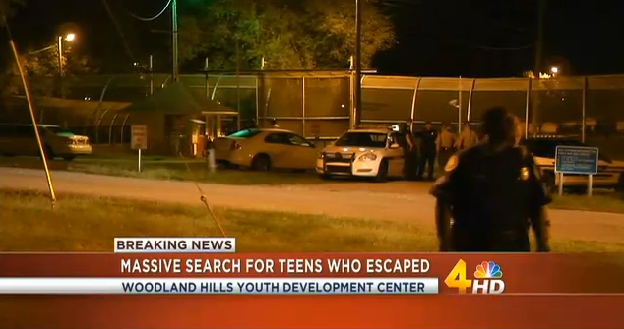 Juvenile detention escape: 32 teenagers break out of Tennessee facility with history of problems. The teens were able to get into the yard and then broke out through a weak spot under a fence, Johnson said. The escapees are all boys between 14 and 18 years old who were brought to Nashville from across the state. Last year local NBC station WSMV obtained photos and video of Woodland Hills guards sleeping while on duty. WSMV’s piece noted that during a six-month period in 2012 at Woodland Hills, there were 17 reported assaults against staff members and 50 assaults by juveniles on other juveniles.